Some of us have two left feet, and may not have the body of a dancer, nor may be flexible like one. If this sounds like you, our favorite Dancing With The Stars Dancer Cheryl Burke can give you hope. Burke recently shared with Yahoo! Sports how important it is to warm up before getting into any dance routine. She says that it actually can help you become a better dancer. Burke recommends a quick eight-minute warm-up routine before getting into any hard-core work out. The warm up helps to strengthen and stretch out the muscles for the hips, thighs, and ankles. Burke suggests it be done three days a week, starting with jumping jacks for two minutes before going into the moves. Next time your two left feet get in the way take Cheryl’s advice by engaging in a proper warm up before you jump out on the dance floor. Fitness Correspondent Hannah Townley Via Yahoo! Only two weeks have past since the tragic Boston Marathon event. Being from Massachusetts, this tragedy hit close to home for me, literally. It definitely hit close to home for the whole nation, so much so that a lot of television shows have been paying tribute to those who lost their lives and were effected in the bombing. Last week, Fitperez.com announced that Adrianne Haslet, a ballroom dancer who lost her leg in the horrific event would be appearing on Dancing With The Stars and last night she did. Adrianne had her time to shine and was able to tell her story on the DWTS episode. 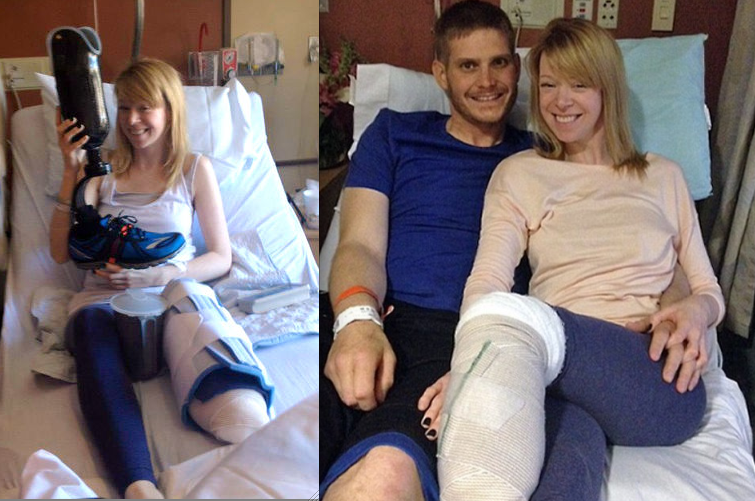 She promised, on air, that after she lost her leg, that she would dance again. “I was in such a dark place mentally, i thought everything was over. My recovery has been tough…but the more I am forced to face it, the better I am, even though it is impossibly hard to deal with sometimes. I absolutely will dance again, and I will do whatever it takes to get there”. I have a feeling we will be seeing Adrianne dancing away on the next season, and I am sure all of America will be voting for her and cheering her on. Beyonce’s Super Bowl Performance Is A Great Workout! Beyonce shut down the Superbowl during the half time perfomance in New Orleans yesterday. Literally she shut it down by causing half the stadiums lights to go out. Her performance was filled with pyrotechnic explosions, halograms, singing and you can not forget all that dancing. It was 13 minutes of straight all out high intensity choreography. Filled with dips, kicks, rolls, turns, all in heels that work every major muscle in the body. Mrs. Carter’s half time performance was one heck of a cardio session working her glutes, quads and core. Beyonce has admitted before that what helps her stay in shape, and what helped her lose weight after giving birth to her daughter was dancing. Spice up your cardio session by putting on your heels, turning on the music and dancing away. A one hour dance session in heels can burn up to 800 calories or more.